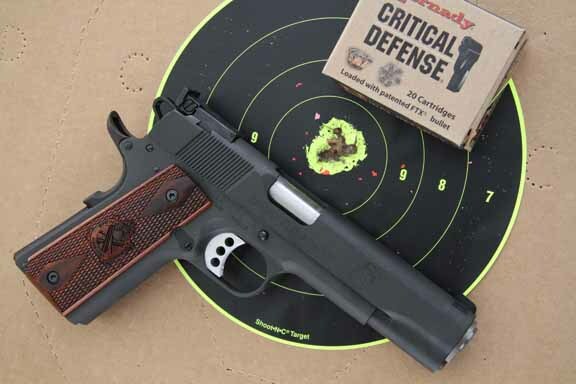 Springfield's new Range Officer is an economical, feature-packed 1911 with accuracy to spare. One of Springfield's latest 1911 pistols is the Range Officer. It's built on a forged slide and forged frame, with a stainless steel match barrel, and the parts are to the same level of detail as Springfield's TRP and Trophy Match models. Translation: The slide, frame and barrel are fitted as if they were going to finish their time there as high-dollar match pistols, but with an absolute level of reliability. On the Range Officer, Springfield puts on the things you need and leaves off the things you don't. Well, there are some things you might need or want that aren't on the Range Officer, but they'd cost lots of money or time to build. You get an adjustable rear sight, beavertail grip safety and a large but not competition-sized thumb safety. The Range Officer has a long trigger and Springfield cocobolo grips, all on a Parkerized frame and slide. The rear sight is machined down into the slide—a trick we did in the earliest days of IPSC competition, one that made for a pistol that was a lot easier to carry and a lot easier on your clothes and hands. Back then, having it done would cost us as much as a couple of hundred dollars. Now, you get it included on the gun. The trigger is clean and crisp, and while the standard as-shipped weight is a bit on the high side for some shooters' tastes at 40 ounces, a carry 1911 with a clean five-pound trigger is perfectly fine for me. Left off are checkering, magazine funnels, guide rods and other competition- or owner-specific details. No stainless except for the barrel, no hard chrome, no extra serrations or pinstriping. In particular I like the standard recoil spring guide rod and parts. The more I shoot 1911s, the less enamored I am of the whole full-length guide rod phenomenon. And while a checkering, stippling or some other frontstrap treatment will certainly improve your scores, it won't improve them as much as you'd think. Oh, there's one custom touch that Springfield does include: the mainspring housing. It comes checkered. But then, all the Springfield 1911A1s except the Mil-Spec come with checkered mainspring housings; it's just something the company does. It also has the Springfield locking system, which allows you to lock your pistol and prevent it from functioning when you store it. In the hard case with the Range Officer, Springfield includes a pair of plain, blued seven-shot magazines. Springfield has clearly put some thought into this pistol. What it has done is produce a base-model carry and competition gun that will work for just about any kind of competition you care to apply it to. USPSA/IPSC Single Stack? Check. IDPA CDP? Ditto. PPC? You bet. Bullseye? I can't see why not. 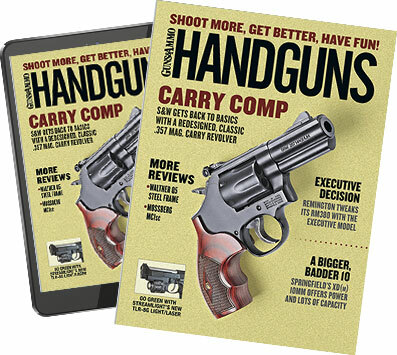 Moving up in gear from the basic level, each competitor in those disciplines will want to have his or her personal changes made or modify the pistol within the rule guidelines. You get this for a price that is just over $900, suggested retail, which means you can get it for less than that. In my testing, I found the fit is what Springfield says it is: The slide-to-frame fit is tight but smooth, with no wobble and no slack in the barrel lock-up. The barrel link-up timing is correct, and the ramps (frame and barrel) are correctly angled and positioned. The stainless-steel bushing, while fitted without play or slop, can still be disassembled with one's bare hands. Again, no surprise there. Springfield has been making 1911s for a long time, and its designers know what they are doing. The safety has the proper detent tension. It clicks up and down with proper force and is highly unlikely to be in the wrong position by accident. The trigger was a bit gritty at first, as the shipping oil was still in it. But a bit of dry-firing and then some shooting smoothed it out, and it proved to be clean and crisp with a pull of just barely under five pounds. There will be some who will object and say that unless it breaks like a glass rod and has a pull of 31/2 pounds at most, it isn't a "proper" trigger. Nonsense. Until you are in the position of contesting for the championship of the single-stack universe with Robbie Leatham himself, five pounds will serve you admirably for a long, long time in competition. And it will serve you perfectly as a carry gun for, well, forever. The grip safety works as it's supposed to: It blocks the trigger until you depress it and then allows the trigger to do its work. As with all other Springfield Armory 1911A1 pistols, it does not have an additional firing pin block. It is the way Mr. Browning intended it to be. In function, the Range Officer worked with everything I had to feed it. Empties were extracted cleanly and tossed to the side without being mangled nor being hurled so far one has to leave a trail of bread crumbs to get back to the firing point. Reloaders (and what 1911 owner doesn't reload?) will be able to easily find the empties, and once found they will be ready to get cleaned and then reloaded. Accuracy was on par with a lot of pistols that cost a great deal more, which, again, is what Springfield intended. What you have here is a gun with the accuracy and reliability of a custom gun, or a factory gun that lists for a lot more, without the high cost of the custom touches that don't matter much to your shooting. Tested at 25 yards from a hand-held rest. Average of four five-shot groups. Smallest average: Hornady 185 gr. FTX—1.25 in. Largest average: Wolf 230 gr. FMJ—3.5 in. Average of all ammo tested—2.36 in.